In a pan, heat the oil & add the ingredients for the seasoning (except chilli powder & coconut) in the order listed above. 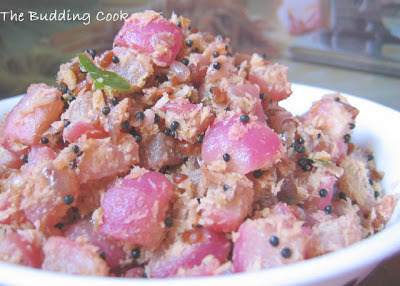 Add the chopped radishes along with the chilli powder, mix, and cover and cook till tender, 5-7 minutes. The radishes would have turned a lighter shade of pink by now. Reserve about 4 Tbsp of this to make the *raita. To the rest, add the grated coconut and mix well. Cook for another minute or so. Thoran’s ready! Mix the cooked radish mixture (reserved from above) with 2 cups of yogurt that has been whisked well. Add 2-3 chopped green chillies and some salt. Mix nicely. 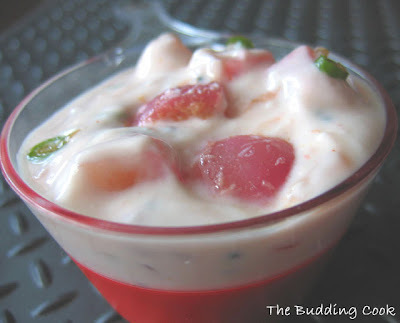 Radish thoran and raita looks so good. Lovely color. YUM! So cool. Very interesting ways with radish. I've taken a great liking to them recently. I have always liked these pink radishes because they are so pretty. Both the recipes look good, I want to try them. Rachel- I know what u mean. :D I too buy only the few regular veggies that I know what to do with. Don't like to experiment a lot. Rajitha- :-( not even if I made it for you and served it with lotsa love? ilove mullangi! thoran sounds like a good idea, usually make sambhar with the small red ones. The big white moolis - go into raitas, parathas, subzi with the leaves and all! but yes radish thoran is a good idea! MR- thanks! Please do. :) I hope you like it.